CNC is the control numerical control to manage all main press brake moveable units and adjustments. The press brake equipped with CNC is named as CNC press brake. At the present most of manufactured and supplied machine are equipped of CNC. In true words CNC means multi-axis control which means the control numerically at least 2 axis: beam stroke (as Y axis) and the horizontal movement of the backgauge (as X axis). The presence only of simple digital controller on the machine, for example for backgauge approach, doesn't mean CNC control. Also important to know that also the presence of CNC doesn't mean the full automatic control of all axis presented on the machine - for example CNC could control beam and backgauge X axis and the vertical stroke of backgauge will be manual with handwheel adjustment. Together with the main values such as stroke, force, backgauge movements, crowning motorization and alarm screens all modern CNC allow to show the press brake tools simulation on the machine, manage tooling library and display 2D or 3D simulation as the projection of theoretical bending for desired parts. This procedure allow to control by the operator the possibility of bending and absence of collisions of part and the press brake tools or construction of the machine itself. 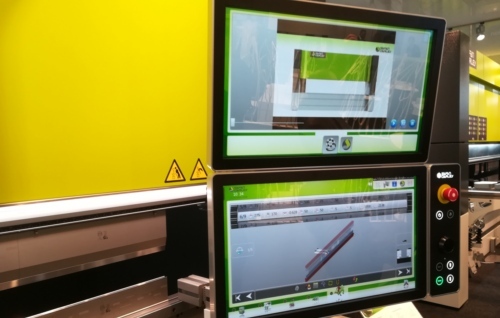 The most powerful CNC software can generate precise sequences of bending and the positioning of backgauge according to every single bend configuration. CNC is the modern development which brings digital possibilities for press brake bending technology including all necessary calculations, force modes, position of units and pre-bending control before any real activity. After the completeness of the program operator can just press the pedal and move the part in the right way. Moreover if the complete tooling library installed CNC software can recommend itself what configuration of press brake tools from library should be used for the desired task. Depends of the manufacturer and the machine CNC can control various others specific functions such as turn off hydraulic in idle mode, force control, periphecal devices like loading-unloading systems, frontal tables etc. As for the all modern industrial machine CNC interface moves from codes programming to visual friendly dialog interface to have the possibility to control the main parameters and enter the values in simple mode without deep knowledge of machine codes. Use of touch screen panels allow also to work with the CNC without any additional cables. As other machine numerical control modern CNC can operate in the digital network with the possibility of distance control and service from the manufacturers side, support of Industry 4.0 or industrial digital factory managing systems. Anyway if the customer requires these functions he needs to discuss it with the manufacturer of the machine. There are independent suppliers for CNC control units for bending such as Cybelec (Switzerland), Delem (Netherlands), ESA (Italy) and others. Also a lot of manufacturers of CNC press brake machines use the internal developments and models of CNC controls which are used specifically for the trademark.